Character change arcs are important. The character begins with a set of personality attributes and beliefs. As the story progresses, the character faces conflicts, internal and/or external, that challenge how he or she behaves and/or what he or she believes. Ultimately, those challenges cause the character to change. A character change arc might be as simple as a coward who becomes a hero. I’m not going to delve into the subtle details of how to manage character change arcs. I only want to mention a concept I find useful. Thirty years ago, in what was back then a fad, my employer strived to improve teamwork and productivity by providing training in interpersonal relations and working with others as a team. One training opportunity was the viewing of a video by Morris Massey. Massey’s idea was that a person’s core beliefs and values form in childhood. To change those core beliefs and values in adulthood requires a “Significant Emotional Event,” an event that exceeds the person’s capacity to cope. Ever since watching the video, the concepts presented have given me a tool for understanding people. Now that I write science fiction/fantasy, those concepts apply to my character change arcs. 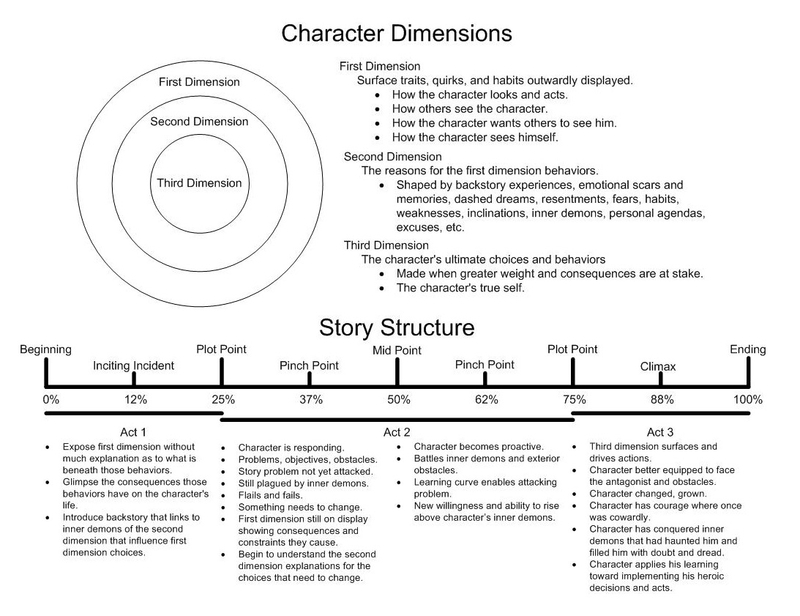 A character change arc may follow the story from beginning to end as an integral part of the plot, or it could act as if it were a sub-story within the greater story. Either way, the concepts of story structure apply to the change arc. The point in the character change arc’s story structure where I invoke a Significant Emotional Event is at the plot point that begins the third act. For example, in my current work-in-progress, over the course of five books, one character has been struggling with his core beliefs. He has dealt with his guilt by justifying the violations as necessary, or finding excuses for committing the violations, or simply ignoring that he is violating his core beliefs. The guilt weighs heavily upon him, but he keeps his core beliefs intact until an additional incident causes him to exceed his capacity to cope, the proverbial straw that broke the camel’s back. He then admits that his life has been a lie, accepts that his core beliefs are wrong, and he changes. The next time you work on a character change arc, consider the Significant Emotional Event that triggers the final change in your character. The attached chart was inspired by what I have learned over the years about character change arcs. I use this chart to remind myself what to consider when working on character change arcs.